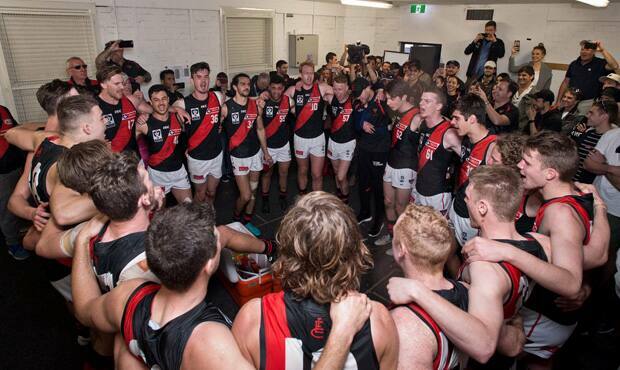 The Bombers sing the song proudly after their thrilling victory over the Tigers. See the best photos from Essendon’s thrilling VFL semi-final victory on Saturday thanks to AFL Photos and Gallivant Photography. Danny Younan celebrates one of his two goals against the Tigers (Pic - Ben Johnstone). Essendon coach Dan Jordan instructs his side during the do-or-die final (Pic - Quinn Rooney). Jackson Merrett reacts after booting a crucial goal midway through the final term (Pic - Rooney). James Stewart assesses his options in front of a bumper crowd at Stannards Stadium (Pic - Johnstone). Nick Hind displays his famous speed as he races away to set up Stewart's match-winning goal (Pic - Johnstone). Stewart showed great composure to kick two last-term goals to keep Essendon's season alive (Pic - Rooney). Emotions spill over after the final siren as the Dons knock out the minor premiers (Pic - Rooney). Essendon's passionate fans surround Stewart during his post-match interview (Pic - Johnstone). Mission accomplished. The Bombers unwind in the rooms after the brilliant win (Pic - Johnstone).